For many, successfully landing that first job in the law sector was not a direct path. After completing your degree, you may feel compelled to jump straight in and start applying everywhere you can. Before you do, take a close look at your CV and amount of experience then ask yourself; could I do more? These essential points should help you secure the dream job you deserve. It is very likely that your CV is going to be just one in hundreds that the law firm has received. If it’s overly long, vague or confusing to read in anyway, you can guarantee it’s headed straight for the shredder. It goes without saying that your CV needs to have perfect spelling and grammar. It may seem fickle, but a misused apostrophe could end your application before it even starts. This isn’t the time to be flowery with your language – save that for your covering letter. It needs to be clear, consistent and concise. Separate your CV into relevant categories and order them according to their level of importance. Contact details should go at the top and references should be at the bottom. Experience, education and key law skills go in-between. Make the effort to tailor each CV to a specific law firm. Potential employers can spot a copy-and-paste job a mile away if you’re sending these out in bulk. Put some extra effort in and concentrate on what you can offer that specific company. Lawyer 2B has an excellent survival guide for those about to start a mini pupillage. You should have already gained some form of experience during your degree, but you can be sure there’s someone else out there that’s got more. Put yourself at the top of the pile by getting even more after you graduate. Make a list of all the local law firms in your region and enquire about potential holiday placements they might be running. Contact your faculty and enquire about legal pro bono work. Not only will you gain real-life experience, you’ll also demonstrate your willingness to work and keep your knowledge up to date. If you’re an undergraduate, try to take part in a mini-pupillage. It’s a great way to develop your understanding of a barrister’s job role. You’ll get to make court visits, check papers, discuss cases and attend client meetings. You should also ask about any opportunities of work shadowing at cambers and firms. If you live near London, Freshfields is offering graduate law jobs and training to talented individuals who can further the success of their company. If you need more experience before applying, Targetjobs has an excellent database of training opportunities available. 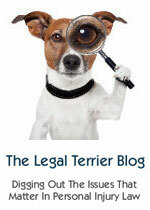 For all you Personal Injury lawyers and fans…Tim Kevan’s new Legal Terrier blog! For all you Personal Injury lawyers and fans…I am delighted to link to Tim Kevan’s new Legal Terrier blog! Guest Post: How to find out if a solicitor is qualified? How to find out if a solicitor is qualified? Hiring a solicitor is an important and potentially life-changing decision. Because of this, there is nothing wrong with taking time over the appointment and asking essential questions about the solicitor’s background beforehand. The initial check should be with The Law Society. This is the professional association that represents legal matters in England and Wales where solicitors will be registered. If you have sought out a solicitor but they are not registered on the site then they are not actually qualified to practice. Some solicitors and law firms will be classed as accredited specialists. This means that they are experts in a particular field – be it concerning children, criminal litigation or family law – and that the Law Society has found their work to be of high-quality. Visit the Law Society website and the ‘Find a Solicitor’ page to check out your legal representative’s credentials. Checking other law societies related to a particular legal field is also a possible route to take. For example, Resolution is an organisation associated with Family Law where solicitors registered here will be well equipped to deal in this line of work. They will have signed up to an official code of practice that adheres them to an impartial and amiable approach to family law matters, in particular looking out for the children’s best interests. Similar to the Law Society firm, you can check to see if your solicitor is registered with Resolution here. Another efficient way to check the credentials of a solicitor is to discover their history in a certain area. Some lawyers may have dedicated themselves to collaborative law or mediation for example, which can both be found on the Resolution website also. You can check out online solicitors such as Breens Solicitors who on their own website outline the qualifications and their history in law. Depending on your circumstances and legal position, there will be solicitors who are trained in a particular area who have experience to increase your chance of success. Actually discussing the matter with your solicitor is perhaps the most obvious way to discover their credentials. No professional should feel uncomfortable about this and be willing to disclose as much information as is required. Also ask for their registration number with The Law Society association. Ask questions regarding their history; for example, which types of case do they typically deal with and how long they have been practising. Enquire about their or their firm’s experience in the exact case you are facing also. Gauge their understanding of your requirements from their attitude and answers. Forming a good relationship with your solicitor is a very important; they will be your strongest asset in the forthcoming legal action after all. Forming a degree of trust and being completely honest with each other is again a crucial factor for a successful association. Do research from as many sources as possible. Ask for any recommendations from friends, family and work colleagues about a suitable solicitor. Check any reviews or testimonies that are available online, looking for both positive and negative feedback. One useful site for this is LinkedIN, where many solicitors are listed with their CV’s present also. Hundreds of claims management companies have been ordered by regulators to disclose detailed information of their financial dealings with PI law firms. The Law Society Gazette reports that many PI firms are now “in a state of panic” as the government investigates select CMCs. Their fear is that the regulators’ findings have the potential to expose a flagrant disregard to the referral fee ban, and it could leave many facing heavy fines or even the prospect of being struck off. For the CMCs targeted, the Ministry of Justice and SRA have requested all records of referral fee payments received before and after the ban came into effect on 1st April 2013. The investigation is taking an almost forensic-like approach to data and evidence about the ongoing relationships between certain CMCs and PI firms. Some experts have commented that a number of PI firms have attempted to circumnavigate the referral fee ban by continuing to operate their business under the CMC model, but have simply amended documentation by replacing the term “referral fee” with an alternative and generic term such as “marketing fee”. The fact that some PI firms and CMCs have continued in this manner will come as a surprise to few in the industry, but their aura of invincibility appears to be waning, finally being replaced by a growing fear of reprisal. Although figures suggest that the number of operating PI-specific claims management companies in the UK has fallen by almost a third to around 1700, it is clear that the referral fee ban in itself has not been a complete deterrent. However, the steps taken by the MoJ and SRA show that such defiance will not be tolerated. There has been much debate regarding the referral fee ban; whether it is a viable amendment to the PI legal process, and in particular, how it will be enforced. In some quarters, there has been a feeling that the SRA would not have the resources to challenge the sheer volume of companies that may be in breach of the ban. To aid this, the Ministry of Justice will undertake restructuring in order to manage their levels of enquiry. Notably, by the end of the year the MoJ plans to shift responsibility for the voluminous CMC complaints away from its own Claims Management Regulation Unit (CMRU) and will hand it over to the Legal Ombudsman (LeO). This will free up the CMRU to focus on CMC quality standards and of course, target the rule-breakers. However, the government has indicated that new legislation is needed to ensure that CMCs (rather than the wider legal profession) cover the LeO’s costs. As is well known, the CMC model for PI litigation is blamed for the ‘compensation culture’ that has gained prominence throughout the UK, with the number of false claims made considered to be responsible for the blanket exponential rise of insurance premiums. Unfortunately, the rise of ‘compensation culture’ can certainly be blamed for a change in the general public’s perception of PI law firms (and perhaps the legal industry as a whole), with all practitioners lumped in under the same umbrella daubed with the obligatory and derogatory term ‘ambulance chasers’. A particular problem caused by this could be seen in catastrophic injury cases, such as when somebody was required to make a spinal cord injury claim. Often, CMCs would refer the case to an ill-matched, inadequate or sub-standard PI firm, when a specialist law firm would be much better equipped to attain justice. On the other hand, some have argued that the enforcement of the referral ban would favour large law firms as they ‘swept up’ all available and remaining cases, or that it could perhaps encourage a profit-driven industry where attainment of justice trails a distant second, though there is little evidence of this so far. Of course, it is too early to draw full and in-depth conclusions about the effectiveness of the referral fee ban. But it is hoped that the referral fee ban will increase the profession’s quality of service by removing substandard firms and CMCs from the equation. Ideally, PI firms instructed to act will be suitably matched to their clients’ needs, and not as the result of a prearranged financial relationship between two separate corporate entities. It is a chance to change the nation’s perceptions about the industry; to prove that PI firms’ primary focus is for a fair legal system, not for legal tender. September 3 2013, London – Transatlantic Law International (TALI), a global business law innovator with over 3500 lawyers in affiliated firms worldwide announced today the launch of Labor Law Plus™ , a new global legal resource providing integrated labor and employment law services, as well as full business law support in more than 80 countries to the global legal and human resource communities. Based in London, United Kingdom, TALI has been a leader since 2001 in delivering global legal services in new ways to companies and investors seeking growth and restructuring worldwide. Labor Law Plus™ will concentrate on serving multinational and growing clients who are looking for a fast, flexible and cost efficient service for labor and employment issues, as well as complete legal support, worldwide or in any region or country where support is needed. The launch of Labor Law Plus™ coincides with the growing demand for global labor and employment law services, a service sector estimated to generate over $65-75 billion annually in revenues worldwide, and which has been served primarily either by traditional law firms, loose law firm referral networks, or more recently by major US based labor and employment law firms expanding internationally by opening offices overseas in some countries or forming alliances with other law firm groups. In contrast, Labor Law Plus™, an expansion of TALI’s longstanding global L&E practice, brings to bear highly experienced, international level L&E legal teams in more countries than any other integrated L&E law service, with dedicated global, regional and country team leaders in over 80 countries who have been working together for many years to deliver a centrally managed service with a single set of terms and centralized billing and cost control to clients worldwide seeking comprehensive single source solutions. In addition, as part of TALI, Labor Law Plus™ will be able to provide complete business law support to HR and company law departments in critical areas such as mergers & acquisitions, opening and closing of offices, restructuring, and many other areas of business law which intersect with labor and employment law issues, distinguishing the service from labor and employment law firms or groups which are concentrating on offering only L&E services. TALI’s founder and Director Erik Lazar said: “By harnessing top rate legal teams across multiple countries under one centrally managed global service system without the overhead and layers of traditional firms, we have shown that we can deliver global solutions more readily and achieve a tighter control of legal spend while providing faster and more effective service delivery, in a way that also relieves clients of the need to manage multiple legal relationships. Labor Law Plus’s advantage is that it is a simple and effective one stop shop for the global HR and legal communities with all L&E legal requirements handled under one roof centrally – or by region or country if the client prefers – in a way that also addresses all other business needs that impact on or result from L&E decisions. Labor Law Plus also finds solutions in countries where it does not currently provide dedicated coverage through an extensive network of correspondents and contacts across all continents. Recent assignments have covered countries as varied as Yemen, Cameroon and Trinidad and Tobago. The L&E legal teams are augmented by teams of business law coordinators from the same affiliated firms operating as part of TALI’s overall global service. All Labor Law Plus’s teams are all drawn from highly ranked longstanding affiliated law firms known for their excellence in international, national and cross border issues in their own jurisdictions. The firms have been selected based on their expertise and ability to work with clients effectively in faster and more effective ways than traditional firms with an emphasis on service delivery and cost control as well as expertise. Clients of the service include leading multinationals and growing companies from the United States, Europe, the Asia Pacific region, Middle East and elsewhere. “”We expect the service to continue to expand and grow to meet global L&E and business requirements Everywhere Business Needs To Be™ – a by-word for all our services which both captures where we are and is a service pledge we take seriously” Lazar concluded. At the end of the litigation process for a serious injury claim, compensation may be arrived at when the court orders a suitable damages award, or alternatively where both sides reach an agreement in an out of court settlement. Either way, there is a great importance for successful claimants to create and utilise a Personal injury Trust. In general, serious and catastrophic cases (such as those for a spinal injury claim) require a substantial compensation award in order to cover the claimant’s considerable schedule of loss. This ranges from the relative simplicity of covering their past and future loss of earnings through to their extensive care and rehabilitation regime, as well as for any bespoke aids and adaptation requirements. Provisional damages award – In this case, an initial amount of compensation is awarded but may be increased at a later date should the claimant’s condition deteriorate. Periodical payment order – This is where the claimant receives a fixed annual amount of compensation. It often follows an initial lump sum award to cover losses. Lump sum settlement – A one-off compensation payment to cover the claimant’s losses and outgoings until their death. Historically, lump sum settlement payments have been the most common type of award for personal injury claims; however recent times have brought about a change with periodical payment orders (PPOs) gaining considerable popularity. Somebody who suffers from a spinal cord injury may be awarded a lump sum compensation payment and of course, this type of funding is an incredibly useful and vital resource. It is one that can be used instantly to address many of their immediate physical and mental challenges, yet it is not without its disadvantages. If the large lump sum compensation award is paid into the claimant’s personal bank account, then they run the risk of becoming ineligible to receive means-tested benefits. Should the claimant’s compensation be in excess of £6000 (or if it increases their existing financial assets to over £6000), then HMRC will treat the funding as income received regardless of the fact that it is intended to support the injured person for the rest of their life, and will deem the claimant ineligible to receive benefits. This has the potential to have disastrous impact on the injured person’s life. What if they live longer? What if they overspend? Or even make unwise investments? If the money runs out, then it is highly unlikely that a spinally injured person will be able to earn more at a later date, so without means-tested benefits, where will their future income come from? There is hope however, for such people who receive large personal injury settlements. This is through the founding of a Personal Injury Trust. Personal Injury Trusts are legally binding financial agreements where a bank or building society account is opened solely for the purpose of managing a successful claimant’s compensation award. It is a perfectly legal financial arrangement and one that is recognised by HMRC and the Department for Work and Pensions. When the compensation (or interim payment) is deposited into the trust, it is not treated as income by HMRC, meaning the claimant will not exceed the £6000 threshold and therefore stay eligible for such means-tested benefits as the new Universal Credit Scheme. Even those who may feel that they do not require benefits, it is advisable for them create a trust so as to remain eligible. This is because there may come a time when their condition deteriorates to such a level that further funding is required. Aside from the obvious financial benefits, there are also administrative advantages as well. In particular, a Personal Injury Trust that is well-managed by trustees helps those who have suffered from extremely debilitating conditions such as tetraplegia as a result of a serious spinal cord injury, as they are most likely to be permanently incapacitated and unable to adequately manage their own affairs. In addition, a Personal Injury Trust is useful for seriously injured people below the age of 18. Classed as minors, their parents, guardians and/or legal representatives are able to manage the compensation award on their behalf. The injured person (claimant) is the trust’s beneficiary, whilst other people are chosen to be the trustees who look after and use the compensation correctly. Usually, reliable family members or those in positions of authority are appointed, such as serious injury lawyers or financial advisors. In addition, the claimant/beneficiary is often also appointed as one of the trustees so as to maintain an element of control in the funding. Trustees are only to use the compensation award in the best intentions for the beneficiary, and in some cases, for other people stipulated in the Personal Injury Trust’s guidelines. Compensation alone is not the end of the story. It must be used wisely to support the successful claimant for the rest of their life, and the financial security offered by a Personal Injury Trust is one of the most efficient ways of doing so.